I’ve had the chance to sit down with some of our state’s most influential leaders and find out more about their paths and passions. 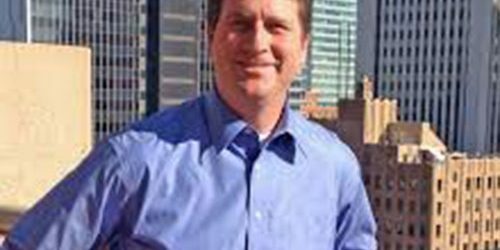 I’m especially excited today to share with you a conversation I had with Mayor Greg Stanton, our very own mayor of Phoenix. Mayor Stanton is a native Arizonan (yes, they exist!) and has spent the past three years leading our incredibly fast-growing capital city. As we talked, I learned more about how his family molded his outlook on life, how helping others is ingrained in his character and how holding office holds a lot of meaning to him. A. I grew up in West Phoenix near the Metro Center mall in a working class neighborhood. My family included myself, four siblings and my mom and dad. I went to public schools and my parents were very active in our church. It was a great upbringing. You’ve probably heard me say this 100 times, but one of the reasons I am so passionate about transportation is because we were a transportation family. My dad took the bus every day to his job selling shoes at J.C. Penney and my mom taught at the Learning Assistance Center at Glendale Community College for many years. My parents were a huge influence on me. My family was always committed to giving back to the community, mostly through our church - St. Jerome Catholic Church in northwest Phoenix. The best way to describe it was that my family was in the working class and did not have a lot financially. Most of the clothes I had were hand-me-downs from my older brother. I didn’t appreciate it at the time, but I do now. My parents ran an organization called Christian Needs Network, which is a wonderful group of church volunteers. If there was any need in the community, they would try to figure out how to fill it. Every single day people would deliver items to our house - food, clothes, diapers, shoes. Even if they weren’t personally involved in the Christian Needs Network, they knew my parents were. We would help the migrant workers, send Christmas gifts to juveniles at Adobe Mountain, one of the schools run by the Arizona Department of Juvenile Corrections, and churches in south Phoenix. Our living room would be filled with stuff – none of which belonged to us, and we would give it all away. So, at a very young age, I learned that it is all about helping others. My parents did this for 35 years. Every single day, without exception they were helping others. I could spend an hour telling you about all of the people they helped, and they never talked about it. They never bragged. I also had some good teachers at Manzanita Elementary School and Cortez High School that were good influences on me. Particularly in high school, I had a great government teacher, Mr. Smith. He really helped develop my passion for public policy. He did such a good job making political issues come to life through debates and such. I think that is when I really developed an interest in politics. Were you in leadership roles when you were younger? For as long as I can remember, I was in student government positions. I tried to stay active in school. And, what about college? Were you in leadership roles then? I went to Marquette University in downtown Milwaukee and had a great time there. My interest in urbanism came from Milwaukee – it has a vibrant downtown. I spent my time in college focusing on volunteerism. My buddy and I developed an after school program for inner city kids at the local YMCA. We worked on homework and played basketball with the kids. I spent two years working at the Milwaukee Urban League, which was another great learning experience. I was given a grant to do a study on unemployment in Milwaukee’s inner city. Every employee in the office was African-American and I was the only Anglo American. It was not only a fantastic community experience, but also a great lesson in diversity. How did you find yourself in politics? After college and law school, I moved back to Phoenix and started practicing law. At the time, I also became very active in the community. Phoenix truly is a wide-open town. I didn’t know anybody except for my family and a few guys from high school basketball. I knew no one, especially no one in politics. And, less than five years later, I was appointed to the Phoenix City Council. I built up enough of a resume participating in community activities that they trusted me and knew my heart was in the right place. By the way, it also helped that I didn’t have a lot of enemies since I was new to the community! Some of the other council applicants had a lot of good friends, but a few people who didn’t like them very much. I was neutral territory. I always knew I wanted to get involved in public service, but that was my path. And, I realized early on as a Democrat that I wasn’t interested in the state legislature. It was at the city that you could get things done. The city is a great place to be in leadership to make a positive difference in people’s lives. I love it! Financially, it was an insane move to leave the practice of law to enter public service. But, my parents taught me to help others. My parents had one way of helping others, and my way is through the political system. I think of it as a parallel track. When you grow up in the Stanton family where it is all about helping others, you have to take the opportunity when presented. Really, politics is an inherently irrational thing to do. If you were ever to sit down and write the pros and cons of entering political life, there is no doubt by any rational measure that the cons outweigh the pros. What career would you enter in which the hours are long, you work seven days a week, have late night meetings, are yelled at all the time, have your motives impugned every time you vote on something (and feel ok about that), don’t have a lot of time for your family and don’t get paid much? But if you love it, you gotta do it. And I love it. Every minute. I wouldn’t change anything. I wouldn’t change a thing about being a leader at the City of Phoenix over the time period I have. What are some key insights you have learned along the way about working with fellow elected officials and constituents? The way I think about it is that there are no permanent friends or alliances on City Council. You can’t take anything personally. I have a great group of colleagues and we generally have the votes to move the city forward in the right direction. But, I don’t take any vote for granted. As long as a member is voting in good faith and making a decision based on merits, they can disagree with me. I have no problem with that. You never know how the votes will line up on an issue. I am lucky enough that, through the electoral process, the people have given me a great group of council members – some who keep me on my toes and some who share a general political philosophy. What I want my fellow members to know is that I am in it for the right reasons. I play it straight on issues and vote on the merits. What do you see as the biggest opportunities for the City of Phoenix? And the biggest challenges? First off, I am more optimistic now than I have ever been about the future of this city. Sometimes those in politics want to talk about the negative things. The truth is that we have to make smart policy decisions and put on our big boy and girl pants to make serious decisions about our future. I talk to mayors around the country and I think the City of Phoenix is better positioned than all of the other cities for success. I believe if we are having this conversation 10 years from now, Phoenix will have taken its place among the leading economic cities in the country - if we make the right decisions today. People want to move here. They are already doing it. It won’t be much longer before Phoenix is the third largest city in the United States. Believe it. In the next few decades, a city the size of Denver is moving to Phoenix. They are coming. In most other cities, that isn’t the case. Now, growth for growth’s sake is not good enough. But the fact that people are moving here and we are growing is a very good thing. We have to focus on the basics – building a stronger education system so more kids go to college, building a more innovative economy to pay higher wages, and building a more export-based economy to think more internationally. If we do that, and I think we will, Phoenix will take its rightful place as one of the highest quality of life cities in the nation. As for challenges, we need to make the right policy choices. And, the big one is water planning - this is the desert, after all. We are the largest city not built on a natural waterway. So making smart choices now is important. We are better off than California, but the decisions they are making in California are not too far down the line of decisions we are going to have to make in Arizona. We have to prepare for a future with water conservation. We are doing smart water planning – have you read the Colorado River Resiliency Plan? We are working to improve forest health in Northern Arizona because that impacts water. We will be spending money outside of Phoenix to help farmers pay for water conservation technology. As mayor, you have to think outside of the boundaries of your city in order to benefit all cities. That is one thing that I have tried to do, expand the mayor’s office. We have to think outside of the four walls of City Hall and see what we can do to benefit the lives of all Arizonans. The old Nike phrase, “Just do it.” In other words, don’t make a big deal out of things, don’t overanalyze them. If there is a need in the community, do it. Don’t make excuses. Since I’ve been mayor we have done things – City of Mexico office, water conservation, healthcare –these are normally handled by the state legislature. But, with the ideologues there, they haven’t been getting it done so the cities have had to play a larger role. Again, if I can be supportive, build a stronger economy, build a stronger city – don’t tell me a bunch of reasons why I shouldn’t be doing it. Just do it. I spend a lot of time on the job and I love it. This is more a lifestyle than a job. When I am not here, I am with my kids – a couple young ones who are super active in sports, soccer, gymnastics, basketball, swim and theater. They are more overscheduled than I am! Between my wife’s busy career and mine, we spend all of our time with kid stuff. And even if I am playing basketball, it is always involving my kids. Basketball! I recall you being an avid player. In my own mind! The older I get, the better I was. When I was younger, I would mock those old guys at the YMCA that would never play defense and just shoot three-pointers until I became that person. We all age! We have a cat named Charlotte. We are a kitty household. What advice would you give to someone thinking about a career in public service? I get asked this question all the time. People are always questioning or doubting whether to run for office. If you are doubting yourself, don’t do it. Look, don’t worry about who else is running or if your friend is running. If you want to do it, do it! And by the way, some people will not support you who you thought would, and others are going to come through for you big time. Your heart is going to get broken over and over again. There is no crying in politics. If you think you are a good candidate, you are in it for the right reasons and you are willing to accept the sacrifices, then do it. If it’s your passion, do it. This is not game theory. You have to run the race. What’s the worse that happens? You lose. And, I can’t help but ask: How is the campaign going? It’s going well. I have tried to present a vision for the City of Phoenix and take actions to further that. In this post-recession city, who are we? This has been a time of soul searching and I mentioned earlier, I have great optimism for the future. I remember growing up and when Phoenix would pass up Dallas and San Diego on the population scale, we would all high-five each other as if we had accomplished something by purely getting bigger. People ask if me if I’m excited about Phoenix becoming bigger, and my answer is no. I am not. I don’t care about how big we are. I care about growing in quality. We saw how bad the recession was here because we were so reliant on construction and real estate. Right now, there is an unusual alignment going on with the political leaders, the business leaders, foundation leaders, university leaders – we are all acknowledging that we have to change our ways if we want to be competitive moving forward. I have tried to present this office, this city, as a leader in innovation and an export-based economy. Check with me on August 25th, but it appears that the people of Phoenix are supportive of that vision and the direction we are heading. I am lucky to be governing in these fascinating and interesting times in our city’s history. Are we getting ready to compete in this hyper competitive international economy? Are we making the right choices? For the most part, yes. But we still have work to do.